A few weeks back, Susan Beacham was returning to the Chicago area from Charleston, S.C. in the family's Toyota minivan when she heard a teenage question that, for many of us, would kill any summer vacation buzz. "My 15-year-old girl is startlingly bright, but she isn't that excited about breaking loose and coming home with straight A's," says Beacham, CEO of Money Savvy Generation and a financial literacy expert who works with parents and educators. "So she turns to me and says, 'Mom, I'd really love an iPhone.' She's been bugging me forever. 'What if I get straight As?'" For Beacham, the $500 question (it all depends on which iPhone you get, actually) boiled down to a teaching moment centering on an all-important issue for today's parents, especially at back-to-school time. That is: To what extent should kids expect -- and parents dish out -- financial and material incentives in exchange for great grades? It's not just parents getting into the act; before he became the U.S. Secretary of Education, Arnie Duncan experimented with and supported cash bonuses for high marks in the Chicago Public Schools system. But the Great Recession -- as well as the gnawing feeling that mounds and mounds of gifts may condition kids to act like salivating Pavlov's dogs -- has parents rethinking the wisdom of gravy for grades. Before we get to how Beacham handled her own reward-seeking teen, let's hear her take on the matter: "From a parent's perspective, I always thought that incentives are very temporary. A teacher's job is to make kids love learning, and a parent's job is to help them find their inner motivation. And as a financial literacy expert, to me it gets a little depressing." Put another way, Beacham thinks financial lures act like a drug -- very potent at first, but wearing off with time unless children get bigger and bigger prizes to guarantee the same result, year in and year out. A more appropriate strategy might involve offering something that further develops a student's love for learning -- a museum or aquarium outing, for example. Beacham points to those districts that have begun to award "school bucks" for good grades, with students encouraged to use funny money at school book stores for prizes and such. "I'll bet dollars to doughnuts that most of the programs fizzle out in a year or two, because good behavior is based on the incentive -- and children will not perform where there is no incentive. Plus, you're telling these kids to spend, not save, and they learn that just fine on the outside." Another parent-expert, therapist Cherilynn Veland, concurs with Beacham. As her son prepares to start second grade, Veland plans to keep close tabs on how he learns the whole financial picture -- not just the carrot-and-stick mentality of making the grade for material gain. "He gets some financial rewards, but I try to make it appropriate to his age," says Veland, who runs Lincoln Park Counseling in Chicago. "He just can't go buy things. 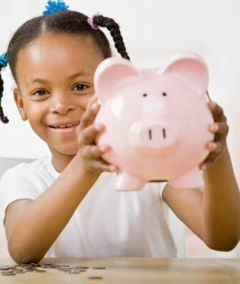 With the recession, he needs to learn how to save -- and he needs to tithe, to give to others who don't have the same things." Veland thinks the Great Recession, in a real-world way, has proven that some people who do all the right things and play by the rules don't get the pot of gold. "A lot of people out there have worked hard, and it hasn't necessarily translated" to keeping a job or getting a bonus, she says. "Parents are in a position to reward their kids in a realistic way ... or you can set your kids up for unrealistic expectations." An example of the latter coming home to roost, Veland says, occurs after college, "when kids have to prepare themselves for their first job by budgeting. Otherwise, they get into this huge credit card debt; they want these things, they have to have them, and they can't wait to have them. The lessons need to be learned, and they either come early -- or they come later." As for Beacham, she decided there was no better time than the present to teach her daughter a much-needed life lesson. Here's what she did: "I said to Amanda, 'You come to me with a semester of A's and we'll talk about a plan to get the phone. But I'm not going to just give you the phone. You just told me that you have it in you to get straight As." And so the fate of the teenage iPhone for fabulous grades remains pending. The ball's in Amanda's court. "She hasn't come back to me and said, 'OK, I'll deliver the straight As.' Really it's up to her. " But if she does come back, Beacham says she has a deal, one she thinks strikes a thoughtful balance between spending and saving, reward and realism. "Both my kids have jobs and I'll help them when they want something; I'll match time for time, dollar for dollar. So she'll delay her gratification. And in the end, she'll get the iPhone -- but it won't be for straight As."